The Catholic Diocese of Monterey has lost their Bishop Richard Garcia, who died Wednesday from complications of Alzheimer's disease at the age of 71. The Diocese of Monterey wrote, "He was proud of his Mexican-American heritage and the diversity of cultures that are represented in the Church." "Most Reverend Richard John Garcia, the fourth bishop of the Roman Catholic Diocese of Monterey in California died this morning, Wednesday, July 11, 2018. Blessed with a deep faith in God and a life of priestly ministry, he passed into the loving embrace of his Heavenly Father. Bishop Garcia was diagnosed just three months ago with the onset of Alzheimer’s Disease and experienced a very rapid decline in health." "Bishop Garcia, a native of San Francisco, California, was born on April 24, 1947 to Manual Garcia and Anita Maria Adame, both natives of Jalisco, Mexico. He attended St Joseph’s High School Seminary in Los Altos Hills, California and received both his bachelor’s and master’s degrees from St. Patrick’s Seminary in Menlo Park, Ca. After pursuing doctoral studies in Dogmatic Theology in Rome from 1980-1984, he served on the faculties of both the college and graduate seminaries at St. Patrick’s from 1985 to 1992." "Bishop Garcia was ordained a priest of Jesus Christ on June 15, 1973 for the Archdiocese of San Francisco at Sacred Heart Church in San Jose, California. In 1981, with the creation of the Diocese of San Jose, he continued to serve as a priest in Santa Clara County. He served as an associate pastor at St. Catherine of Siena Parish in Morgan Hill, California. Before being appointed pastor of St. Leo the Great Parish in San Jose, California in 1995, Bishop Garcia served as the Vocations Director and the Vicar for Clergy." "In 1997, he was named Auxiliary Bishop of the Diocese of Sacramento by Pope John Paul II and was ordained a bishop on January 28, 1997. In December 2006, he was named the fourth bishop of Diocese of Monterey by Pope Benedict XVI and installed as the new Ordinary on January 30, 2007. He served the Church faithfully for over the forty-five years of his priesthood." "In addition to serving as the Chairman of the Restorative Justice Committee for the California Catholic Conference of Bishops, Bishop Garcia also served as the chairman of CLINIC and on various committees for the United States Conference of Catholic Bishops including the Migration and Refugee Committee and the Cultural Diversity Committee." "Bishop Garcia was known for his very personable, welcoming and friendly demeanor. As a spiritual shepherd, he had a special concern for the poor, the incarcerated, migrant workers and immigrant communities. He always had time for his priests, deacons, religious, seminarians and the people of God throughout the Diocese of Monterey." "Bishop Garcia had a special delight for children and was most compassionate to those with special needs. He was proud of his Mexican-American heritage and the diversity of cultures that are represented in the Church." "The Diocese of Monterey asks for prayers during this time of loss." Funeral Mass – 11 a.m. 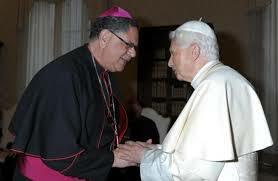 The Diocese of Monterey has kept Bishop Garcia's real condition to everyone. Alzheimers taking his life in 4 months does not make sense and people are making their own conclusions on the true cause of Bishop Garcia's death. Autopsy Report should be made public. What are the health complications that took the bishop's life? Massive heart attack? What kind of care was given to him?